This map, produced using data collected by the Planck satellite, shows a map of the light left over from the big bang. If the universe were not isotropic, scientists think they would find evidence in maps like this one. The universe, it turns out, looks the same in every direction. Of course, this isn't true on a "small scale" — the stars, galaxies, dark matter and interstellar gas that fill the universe are strewn about and clumped together in unique ways. But on a much size scale encompassing the entire universe, new research shows the cosmic landscape doesn't have any preferred direction — there's no axis of spin like the Earth, no massive asymmetries that would orient a cosmic traveler. The new study appears to be the most in-depth attempt to answer this question, which confirms a long-held assumption in physics. In addition, it touches on the idea that Earth does not occupy a special place in the universe by showing that not only is no preferred location in the universe, there is no preferred direction. Some things in the universe look different depending on where you're standing when you look at them, or from which direction you view them. For example, the Milky Way galaxy is a disk that rotates around a central axis like a record on a turntable. The galaxy looks different depending on where its viewed from, so observers in different places see different things. But a galaxy is also anisotropic — that is, an observer in one location can look in different directions and will see something different. The stars located far out in the disk move faster as they whip around the center, compared with stars close to the middle. (This is true for an observer inside the galaxy or outside it). It's that latter kind of variation that's addressed in the new research paper. If the universe looks the same no matter what direction its viewed from, it's isotropic. If it does have a large-scale dependence on direction, it's anisotropic. If the large-scale structure of the universe is anisotropic — different depending on the direction it is viewed from — that feature would have been present from the get-go. A tiny fraction of a second after the universe sprang to life in the Big Bang, scientists think the cosmos underwent a period of rapid inflation, like a loaf of bread expanding in the oven. Very small, random "fluctuations" (like air bubbles in the dough) made it so the matter in the universe didn't spread out evenly, at least on small scales; It clumped together to form stars, galaxies and galaxy clusters, while leaving some areas mostly empty. (This clumping is also observed in dark matter, the mysterious substance that makes up about 80 percent of mass in the universe). But what if the entire loaf of bread was warped, and not just on small scales? For example, what if space-time, the fabric of the universe, was spinning when inflation began? That would certainly affect how a loaf of bread looked when it finished baking, and it would certainly influence how the universe looks today. For example, the universe is still expanding, albeit slower than it was during inflation. That means new space is being created between stars and galaxies, so these objects are all moving away from each other. If scientists measured the rate of expansion and found that things were moving a little faster in one direction and a little slower in another direction, that would indicate that something was lopsided in the universal fabric. That would be evidence of anisotropy. 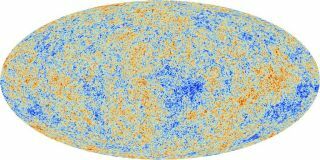 If the universe were anisotropic (did not look the same regardless of direction), it would leave an imprint in the cosmic microwave background. This map shows what one such anisotropy might look like (minus the small-scale fluctuations in the light). The universe expanding at different rates in different directions is the simplest way that anisotropy might play out, according to Daniella Saadeh, a graduate student in physics and astronomy at University College London and the lead author of a new research paper that shows the large-scale universe is, in fact, isotropic. Saadeh and colleagues looked for signs of anisotropy in data from the European Space Agency's Planck satellite, collected between 2009 and 2013, which maps of the oldest light in the universe — the cosmic microwave background, or the light left over from the Big Bang. If the universe were warped or twisted in some way, that light would likely bear some sign of it, according to the authors. Mathematicians have already pointed out ways in which the universe could have been warped or twisted or formed in some way as to create a directional dependence. Those variations can be deduced from Einstein's theory of relativity. Saadeh and her colleagues used computer models to simulate all the ways the universe could be anisotropic, and what each of how each of those outcomes would leave an imprint on the light collected by the Planck satellite. In order to pull this off, Saadeh and colleagues needed both the high-quality data provided by Planck, as well as computer programs that could run through all the possible ways those tweaks could influence how the CMB looks over the span of the entire universe. The left panel shows an anisotropic imprint on the cosmic microwave background; the middle panel shows the small-scale variations in the CMB; the right panel shows the combination of those two. "This is a serious challenge, as we found an enormous number of ways the universe can be anisotropic," said Stephen Feeney, a co-author on the paper, who at the time was a postdoctoral researcher at Imperial College London. "It's extremely easy to become lost in this myriad of possible universes — we need to tune 32 dials to find the correct one." Because the finding is based on statistical analysis, the conclusion is actually expressed as a likelihood: There is a 1 in 121,000 chance that the universe is not the same in all directions. Saadeh says if anyone wants to improve on that number, they'll likely have to wait for another CMB space observatory that is superior to Planck, and nothing of that nature is under construction. In a statement from the University College London, Saadeh notes that "universes that spin and stretch are entirely possible, so it’s important that we've shown ours is fair to all its directions." But in fact, the rule book that modern physics follows ― known as the standard model ― assumes that the universe is isotropic, and has no major variations on large scales. The standard model describes everything scientists know about the world — all the particles that exist in it, the forces that influence those particles, the laws that govern it all. The model also makes predictions; the discovery of the Higgs boson in 2012 had been predicted by the standard model about four decades prior. If Saadeh and colleagues had found evidence that the universe was anisotropic, that would have thrown a wrench in the standard model. "We’re very glad that our work vindicates what most cosmologists assume. For now, cosmology is safe."